Homeowners love sleek, white kitchen designs — and with good reason. They feel more spacious and homier than other concepts and allow you to easily change up other home elements. If you are thinking about taking your kitchen remodeling in this direction, be sure to use this guide. Sticking with the same color of white throughout your kitchen will make the room look flat. To avoid this, select three or four different shades, and place them on the different materials to create dimension. However, don’t mix warm whites — which have a yellow tone — with the cool or blue-toned whites. If you have trouble distinguishing them, ask your contractor, or get advice from a paint retailer. Kitchen remodeling is the perfect time to open up the room to allow more natural light in. If you are designing a white kitchen, it adds to that bright and airy feeling you are probably hoping to achieve. Some ways to do this include adding more windows to the exterior walls — particularly those over the sink — or a skylight. You could also embrace the open layout design, which would remove one or more interior walls to pull in additional light from the rest of the home. If it is not balanced well, a white kitchen can feel stark instead of welcoming. Use accent and focal pieces to create some warmth. Select an earthy or metallic color for lighting pieces to stand against the white countertops and cabinets. 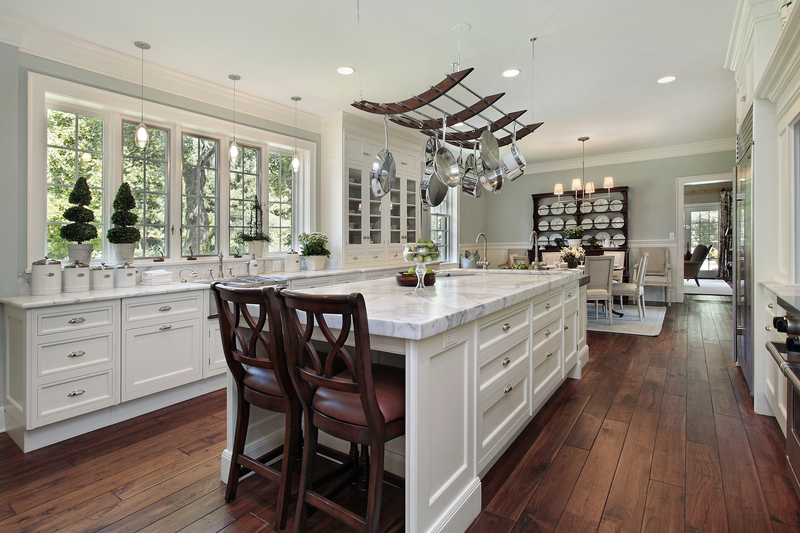 Dark, hardwood floors also provide a lot of depth in this type of kitchen remodeling. You can also select one to three brighter colors for countertop and island decorations. Additionally, if you’ve decided to go with smooth features, try choosing accent pieces that have some roughness and vice versa. If you’re ready to make your dreams of having a white kitchen a reality, stop by Valley Design Center’s showroom in NYC. For over 30 years, they have been the one-stop-shop for all your bathroom and kitchen remodeling needs. They carry cabinets, countertops, tile, appliances, and plumbing fixtures from the leading manufacturers including Kraftmaid™, TOTO®, Great Northern Cabinetry®, and Milmonde®. Best of all, their team of home improvement professionals will guide you through the entire process and then install your selections. To get started on your remodel, call them today at (212) 832-4200. You can also view some of their featured products by visiting their website.